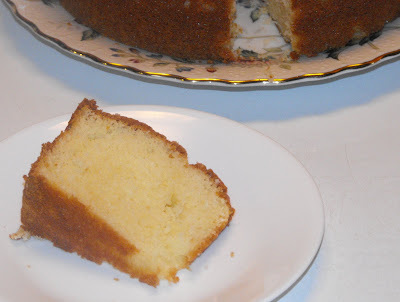 Secrets of a Southern Kitchen: Sour Cream Pound Cake--Made From a Mix! Sour Cream Pound Cake--Made From a Mix! I've been in a food rut. Again. Since the holidays I've been cooking less in general, and not much that's been new or different or blog-worthy in particular. This weekend I decided to jump back into the kitchen by making an old stand-by--what I call sour cream pound cake. It's a beautiful basic cake that can be eaten plain, warm from the oven, dripping in strawberries and whipped cream, or frosted. I usually make this in an angel food style tube pan, but I've also made it in a bundt pan, as a sheet cake, in loaf pans, and even as cupcakes. It's a cake that starts from a mix but becomes so much more by the addition of a few key ingredients. Mix all ingredients until blended, then beat for 2 minutes on medium speed. Pour into a cooking sprayed pan. For a tube pan, bake at 350 degrees for 50 minutes. At the end of 50 minutes, I turn the oven off, and leave the pan in the oven for an additional 10 minutes. If I use a removal center tube pan (like an angel food cake pan), I remove the outside ring and allow the cake to cool on the inner ring. (If you try to take it off the ring too soon, it will probably fall apart, or at least crack). When I use a bundt pan, I cool for about 15 minutes, then turn it out onto a rack to finish cooling. This time, I left it completely plain--sometimes I sift powdered sugar over the top. This is one of those cakes that's delicious eaten plain, warm from the oven, but it also gets better and better the longer it sits--just be sure to cover it well. I love this cake--so easy to make, but it tastes like you really did something special. I make it often in two loaf pans to give as a gifts, and nearly always get a recipe request. what a yummy recipe! following from Tempt my Tummy Tuesday! I love pound cake and the idea of making one from a cake mix sounds WONDERFUL!!!! This really looks tasty. I will definitely have to give it a try soon. Thanks for sharing it. Come join me for Crock Pot Wednesday soon. Hope you are doing well. Thanks for sharing the recipe of Sour Cream Pound Cake. will give it a try this weekend. Hope it taste well. Yum! I love putting sour cream in bake goods, it makes them so moist. I've always loved pound cakes, and I'd loved to try yours. It looks yummy! yummy! I did something just like this recently, but I added cinnamon sugar and swirled it. So gooood! I made this cake twice and both collapsed.i used a bunt pan. Any idea why? We still ate the cake. It was awesome! I made this recipe in a bundt pan and it collapsed. What would cause that? Possibly over mixing or underbaking. Sometimes a thicker cake needs a little more time, so I turn the oven off, open the door slightly, and leave it for an additional 5-8 minutes. Is it the same amount of time for cooking when using 2 loaf pans? 50 min? Yes, I find the time is about the same for two loaf pans or a bundt or tube pan.